Adair, de hoogste woonplaats in The Grampians, is een historisch woonhuis uit de jaren 30 van de vorige eeuw. Het pand ligt aan het Nationaal Park The Grampians en biedt een prachtig uitzicht op de ruime veranda's. Dit historische pand wordt geleverd met uw eigen 25 hectare vol met kangoeroes, emoes, herten en vogels. Adair heeft gezellige logbranden en airconditioning voor het hele jaar door comfort. Het huis wordt gevoed uit een natuurlijke lente die voor een goede kop thee of koffie zorgt. Adair biedt het beste van beide werelden: bushwalking en rotsklimmen beginnen bij de achterdeur; of u kunt geïnteresseerd zijn in alles wat het district te bieden heeft, waaronder: de Halls Gap Zoo, lokale wijnhuizen, lokale producten, restaurants en kunstenaarsstudio's. Slechts 13 km van Halls Gap biedt Adair het beste van The Grampians zonder de drukte. Adair heeft accommodatie voor 10 personen met 3 queensize bedden, twee sets stapelbedden en drie badkamers. From the moment we drove up the driveway we knew we were going to have a fabulous weekend away with the family. Wild emus, kangaroos and deer roaming the property absolutely made our experience magic. The house itself was exactly what we needed! A huge kitchen table next to a fire place where everyone could be together. The lounge room was also great for the little people to play board games and watch the footy! The fireplaces in some of the rooms just added a great touch to this experience. We also loved the fact that there was instructions for lighting fires (handy for the boys ;) ) and a information for things to do in the surrounding areas! We had all age groups from a 1 year old to a 60 year old and everyone was so thrilled. Thank you so much for letting us stay in this amazing house. Forever grateful. The most amazing house in a setting that is rare to find , a house where the animals actually come to you as you sit around the decks sipping cold ones and keeping cool in the stunning mountain setting . A total gem. On arrival we were greeted by emus walking across the front yard as if on cue. The kids loved seeing the emus, kangaroos and goats wandering around the property every day. We had a very warm week at Adair, so made the most of the cooler mornings to go for walks to the Pinnacle and other lookouts, then visited the local lakes on the hot afternoons. 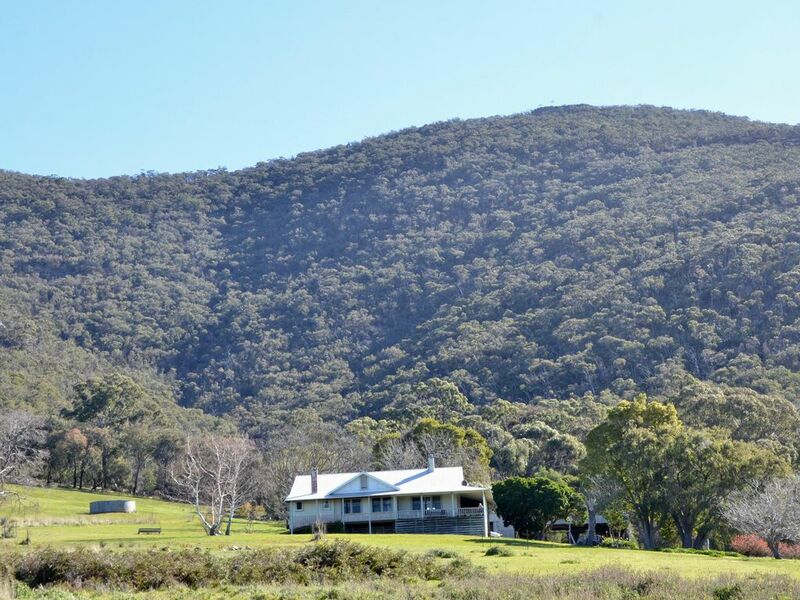 Adair itself is a lovely old home, so close to the Grampians but providing plenty of space to relax and unwind. Afternoon breezes helped cool the house most days and the deck was a popular place to eat while taking in the views. Thankyou Catherine and Mike for having us at your wonderful property, we'll be back. My family of five had a fabulous time at Adair and were bowled over by the continuous stream of kangaroos and emu’s that were a constant presence at the propertyy, quite a unique experience. We were also pleasantly surprised at how well the property coped with the very hot weather. The property is very tastefully decorated - we really loved the sunny window nooks - would be extra nice in winter. A real highlight was sitting out on the expansive deck each night for dinner and to watch the nightly wildlife parade! A special place. So glad you had a fabulous time, Teresa, and that the house coped well in the heat wave. You are welcome back anytime and perhaps you might like to try the house in winter. We think it is a special place too. Great place! Wildlife. Hiking. Comfort. Perfect. A great place for two families to share. We have two boys and came up with our friends who also have two boys. We climbed the mountain every day. We loved the wildlife. The property is very comfortable and practical. We BBQ'd every evening. We did short day trips to Bellfield Lake and other places. Loved it all. Highly recommended. Adair is a gorgeous old house in a picturesque setting a perfect home away from home . Adair was just the best ! A delightful spot to stay . We just wished we had booked it for longer ! Our kids enjoyed nature play at its best , long walks & the abundant wildlife we watched from our balcony . Our hosts made us feel very welcome & made themselves accessible for help if needed be . It was perfectly clean & set up to make us feel so at home . This historic home is full of character & presented well . Particularly perfect for us and our children and was great to unwind on it's balcony with a glass of wine after a day of trekking . Thanks so much Catherine for letting us stay we had a ball & hope to return oneday soon.